The Audio Engineering Society is set to bring the AES139 International Convention to the Jacob K. Javits Center in New York City, NY, October 29 – November 1, 2015 (Conference Oct. 29 – Nov. 1, Exhibits Oct. 30 – Nov. 1). Following highly-successful conventions in Los Angeles (2014) and New York (2013), which saw increased attendance as well as the development of expanded attendee and exhibitor offerings including the Project Studio Expo, Live Sound Expo and High Resolution Audio sessions, the 139th AES Convention will bring together the world’s largest gathering of audio professionals for four days of audio technology, information, and networking. Additionally, longtime industry veterans Jim Anderson and Paul Gallo have been announced as co-chairs for the convention, each lending his own unique and storied experiences to the AES agenda this year. From recording and production, to broadcast and streaming, game audio, live sound, post-production, sound for picture, product design and more, attendees will have the opportunity to hear from top audio industry figures while immersed in the latest research and technology through informative presentations and special events. Furthermore, the AES will once again present the year’s only dedicated professional audio-focused convention, drawing attendees from every market sector and level of involvement – from students and enthusiasts to leading professionals from every corner of the industry. AES Executive Director Bob Moses commented, "I'm really excited that Jim Anderson and Paul Gallo have agreed to co-chair our AES139 Convention. Both are legendary in the NY recording, broadcast and pro audio communities, and we expect to hit the ball out of the park in 2015 just like we did recently in L.A. Lots of new ideas are in the works – this is going to be another great year under their leadership and with participation from our amazing exhibitors and sponsors." 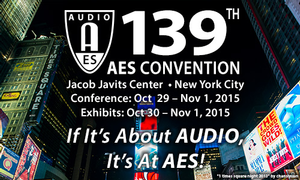 Further information on the AES139 International Convention to be available at http://www.aes.org/events/139/.